Aging well means you must understand what you should do to stay healthy so you can live a longer, healthier life. While how long you live largely depends on your genetics, there are some changes you can make in your lifestyle behaviors that will help you as well. Understanding them and making a few changes can be very beneficial. It’s interesting to note that some of the people who have lived the longest have adopted the Mediterranean diet. This is something that’s being increasingly encouraged by cardiologists in the United States. They believe that meals containing mainly fruits, vegetables, beans, nuts, and whole grains is beneficial. To these items you can add some olive oil, but you should eat very little meat or dairy products. Being physically active daily also helps with aging well. Activities that naturally promote movement, flexibility, and strength are especially important. This includes things like walking or biking instead of driving to the store, growing your own food, and go swimming. These activities are also shown to help build endurance and reduce stress. Instead of living a stressful, frantic lifestyle like many of us in western cultures do, we should slow down and live a simpler life as this will help promote better health. This is important because long-term stress has been shown to increase cortisol and stress hormone levels in your body, which in turn cause heart disease, type 2 diabetes, digestive problems, and depression. Another part of aging well has to do with maintaining a positive outlook on life. If you can train yourself to do as Monty Python says and “always look on the bright side of life” and avoid negative thinking, research says you’ll live longer. When you have a strong network of healthy relationships you can avoid the dangers of isolation. Being around your family and friends will also add more meaning to your days. Living with purpose is another important part of aging well. For this you must learn how to set priorities that guide your daily decisions. Research shows that chronic inflammation causes a host of health issues including Alzheimer’s disease, type 2 diabetes, lupus, and Multiple Sclerosis. To avoid this, you must eat a healthy diet and exercise frequently. Consuming foods and beverages that contain a lot of resveratrol (e.g. red wine) each day also helps. Another important aspect of aging well has to do with your hearing. We all know that as we grow older this is one aspect of our health that starts to decline. When this happens, it leads to a decline in our socialization, mental stimulation, and activity. It can also result in isolation and depression, which in turn will lead to a functional decline in longevity. This is why it’s so important to get your hearing checked on a regular basis. 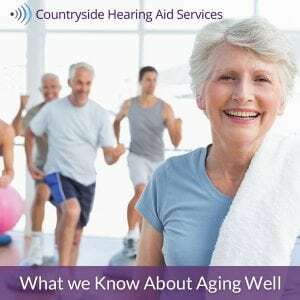 For this you can trust Countryside Hearing Aid Services so contact them today.